Our strong SW groundswell came in right on forecast yesterday morning with solid waves across both coasts, onshore though still fun on the Surf Coast, best in protected spots to the east. The swell has dropped considerably overnight leaving much smaller 2ft to occasionally 3ft sets on the Surf Coast swell magnets but with great conditions, best east of Melbourne and to 3-5ft. The models have been moving around regarding the expected winds through tomorrow as our strong new W/SW groundswell fills in, and it looks like we've got something that's in between being pumping on the Surf Coast, and poor and onshore. Currently a strong mid-latitude low is moving slowly east-southeast under the Bight. A great fetch of W/SW gales are being produced, with peak wind strengths just falling below severe-gale, and this will result in a moderate to large W/SW groundswell for tomorrow afternoon. The swell is due to arrive mid-morning and build to a solid 4-5ft on the Surf Coast swell magnets and 6-8ft on the Mornington Peninsula into the afternoon. Winds will however will be average for most spots and moderate to fresh from the W/SW, but the Torquay region should offer W/NW breezes through the morning. Sunday morning looks cleanest with a W/NW-NW breeze across most of the Surf Coast as the W/SW swell eases back from 3-4ft and 5-6ft+ respectively. The afternoon will be bumpy with S/SW onshores. Monday looks a little average as the swell continues to ease along with a light S/SE-SE breeze. In saying this the beaches should be fun with easing 2ft+ waves on the Surf Coast and 3-4ft sets to the east. Late in the day a long-period SW groundswell should start to show with a peak due Tuesday morning. This swell will be generated by a strong polar low forming on the tail of the mid-latitude low, with a fetch of severe-gale to near storm-force W/SW winds produced along the polar shelf. 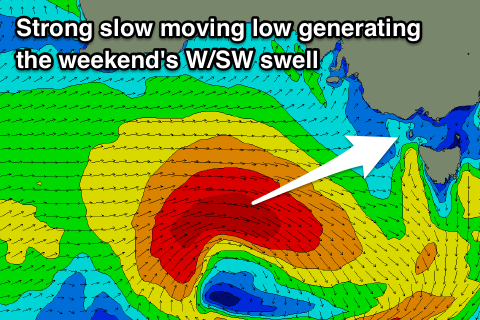 The low will continue east towards Tassie while weakening slowly over the weekend, with a moderate to large long-period SW groundswell due to peak Tuesday morning. 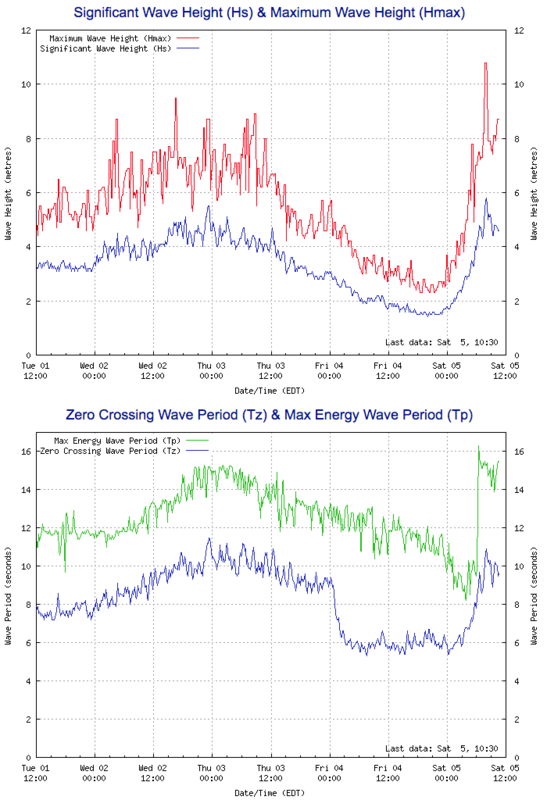 The Surf Coast should see good 3-5ft sets on the swell magnets with 6ft to possibly 8ft sets on the Mornington Peninsula, though winds won't be perfect. A variable E/SE breeze should create workable conditions though through the morning freshening through the day out of the S'th, while an approaching weak front should swing winds to a morning W/NW breeze Wednesday morning as the swell eases from 3ft and 4-5ft respectively. Longer term there isn't anything too significant on the cards, so make the most of the coming swells and generally favourable winds. Have a great weekend! Any firsthand reports from the Surf Coast this arvo? I’m in SA and surfed 20 knot onshore rubbish. Bit of size about though. You haven't missed anything, solid but onshore yesterday arvo, cleanish this morning but the swell has faded rapidly, 2ft with the very occasional head high set. very ordinary but good for a summer paddle I guess. Protected spot out of the wind, um, it was head high coming through from out the back. Maybe a little overhead on some. Onshore was pretty strong. There were lulls, and I didn't reckon it had the size the Sorrell readings might imply. But I didn't see the whole coast. Rubbish this morning. Gutless summer swell. 2 ft surfcoast reefs. Wow, surprised how average Sunday morning sounded.